Contemporary womenswear designer Yoana Baraschi is joining the fight against Breast Cancer with her Breast Cancer Awareness Scarf. During the month of October, 100% of the profits of this limited edition Yoana Baraschi pure cashmere scarf will go to the National Breast Cancer Foundation to support Breast Cancer Awareness. 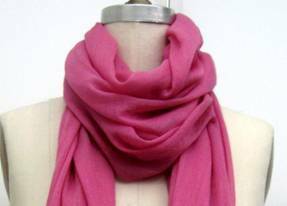 The scarf is available in BCA’s signature pink for $98.60 at YoanaBaraschi.com.